Map of the Territories & Pacific States to Accompany 'Across the Continent' by Samuel Bowles. 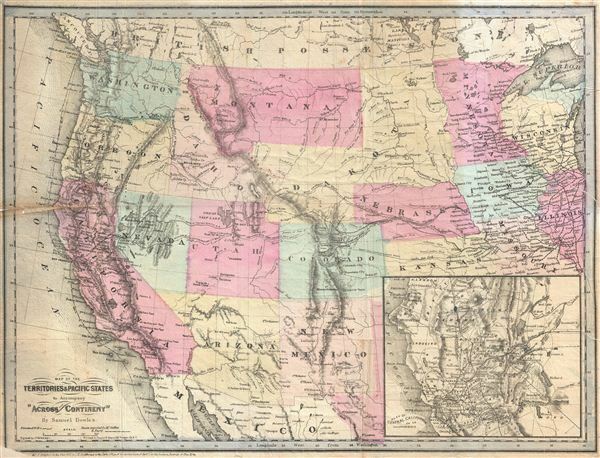 A highly appealing 1865 map of the western parts of the United States drawn to illustrate Samuel Bowles' Across the Continent. The map covers from the Pacific Ocean to Illinois and the Great Lakes. It is notable for its detailed inclusion of important trans-continental emigrant routes, including the Overland Stage Route &amp; Proposed R.R. Route, Route of Central Pacific R.R., the Salt Lake and Walla Walla Mail Route, Smoky Hill express &Stage Route, and more. A large inset in the lower right quadrant focuses on the Sacramento Valley and the bustling San Francisco Bay / California Gold Region. Samuel Bowles III (February 9, 1826 – January 16, 1878) was an American journalist born in Springfield, Massachusetts. Bowles is best known as the editor of The Republican, which he inherited form his father of the same name and ran until his deal in 1878. Bowles was a hands-on editor and his hard work contributed to the success of his paper. By 1840 The Republican was the largest circulated daily in New England and Bowles had become a highly respected figure in journalism. He was also well known for his frequently travels. In 1865 he made the transcontinental journey to the Pacific, publishing the story in a well-read memoire, Across the Continent. He subsequently crossed the continent again in 1869. He also traveled extensively in Europe in the early 1870s. Bowles died in Springfield, Massachusetts. He was succeeded by ten children, one of whom, Samuel Bowles IV, inherited The Republican. Bowles, S., Across the Continent, (New York: Hurd & Houghton) 1866. Good. Minor repair, left center. Publisher error, bottom left corner, affecting border. Backed with archival tissue for stability. Phillips (America), p. 914. Storm, C., A Catalogue of the Everett D. Graff Collection of Western Americana, no. 370.